Over all, Pockethernet sounded like something I needed to look into more closely. 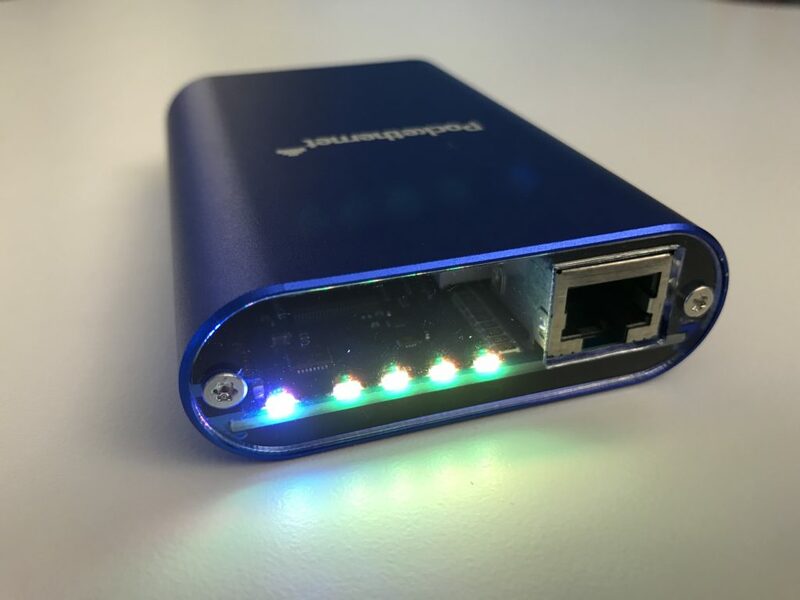 Pockethernet started off with the assistance of a crowdfunding campaign on Indiegogo, raising $185,000 of their $50,000 target. Unusually for an electronic device, Pockethernet is manufactured in Hungary, which was nice to see. Unboxing the Pockethernet I was surprised (but pleased) to discover that the device is packaged in a soft, zipped carry case. 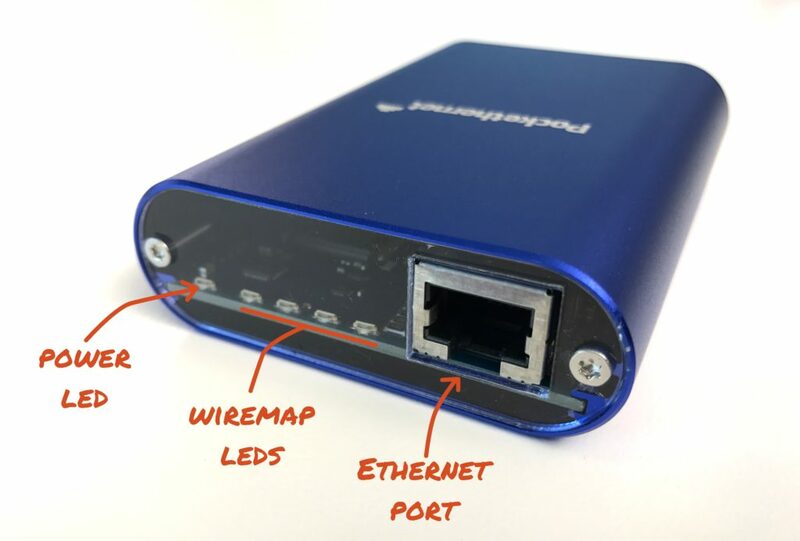 The box also contains a small User Guide, and inside the case is the Pockethernet tester, an adaptor, a short Ethernet cable and a short USB charging cable. There’s also a strip of blue velcro which will be useful to hold the tester in place if needed. 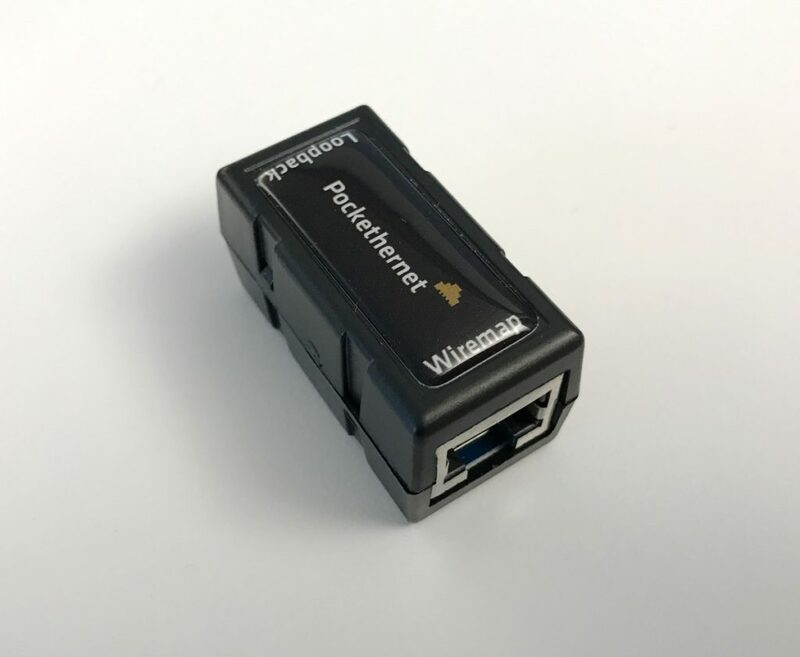 As it turns out, keeping the Pockethernet in that case may be rather important because the two-sided RJ-45 adaptor which is used for loopback and wiremap testing, and keeping that safe and available is critical as it’s made specifically for the Pockethernet tester. 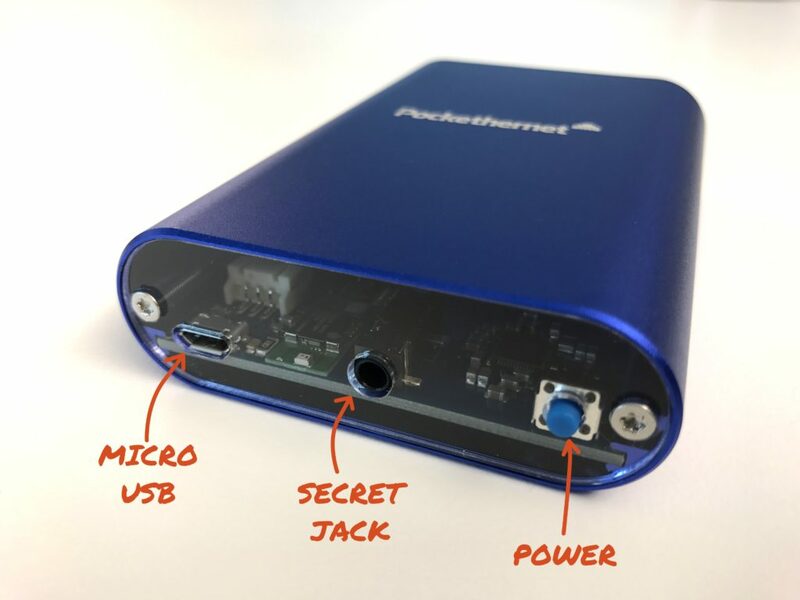 The Pockethernet tester itself is nothing short of beautiful. I do appreciate that form and function are separate things, but it surely doesn’t hurt to build a device that provides both, and that’s what is in the box. The blue metallic finish to the metal case is particularly attractive, but the zinger is that the two end caps are made of transparent plastic, allowing visibility inside the tester. Maybe it’s a gimmick, but I like it nonetheless. 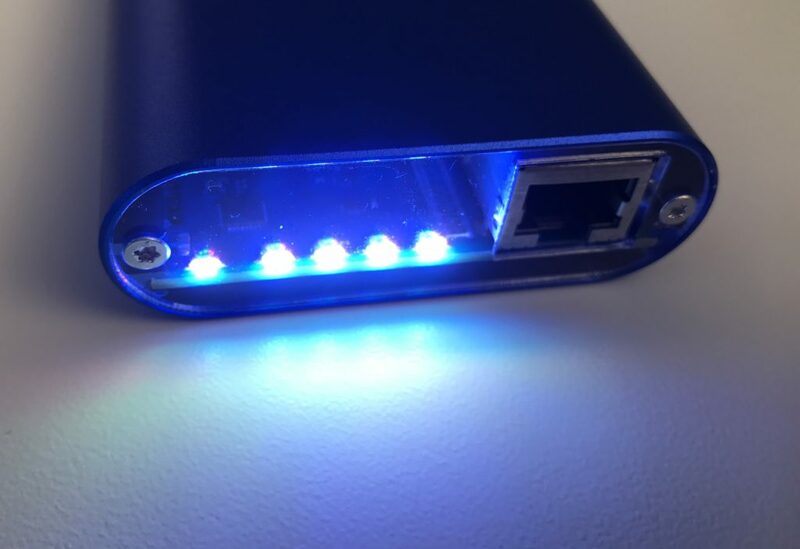 There aren’t many ports and lights on the Pockethernet; one side contains the business end of things, to whit, a micro USB charging port, a power button, and a mini-jack serial port which is apparently reserved for future use. 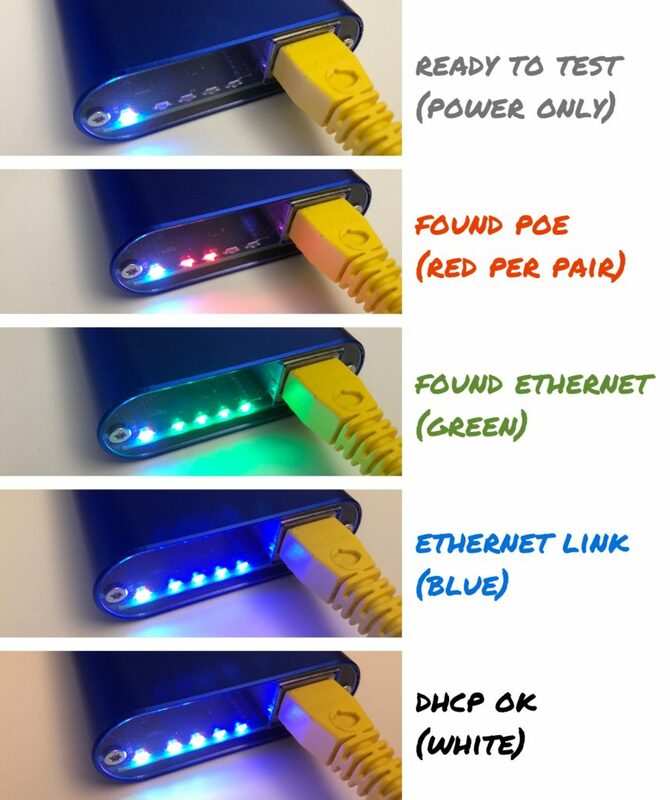 The other side of the tester is the functional end of things, with the RJ-45 Ethernet port and five multi-color LEDs. 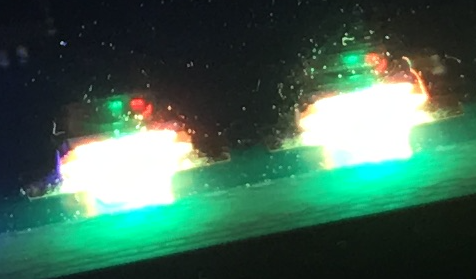 If nothing else, using transparent plastic has allowed the use of surface mount LEDs on the board just inside the end cap, rather than having to make holes in the end cap and somehow extend the LEDs off the board to mount them in place. I will add a comment that the RJ-45 sockets on the Pockethernet and on the double-sided adpator seem to be a tiny bit deeper than usual. 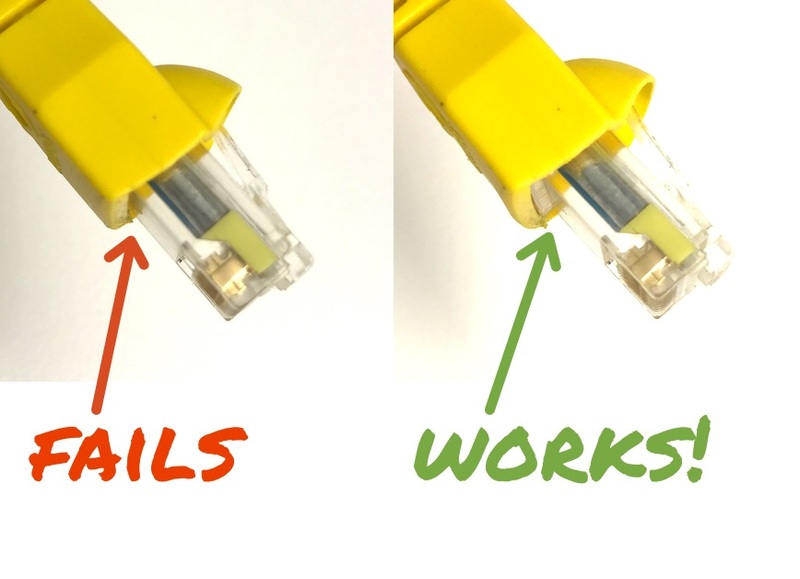 This means that the booted RJ-45 plugs on the end of my (commercially made) Ethernet cable will not allow the plug to click into place properly. If I pull the boot back slightly, the plug clicks right in. I’m talking about fractions of a millimeter here, and I suspect for the vast majority of cables it won’t be a problem, but for my Siemon brand cables, it’s a serious issue. 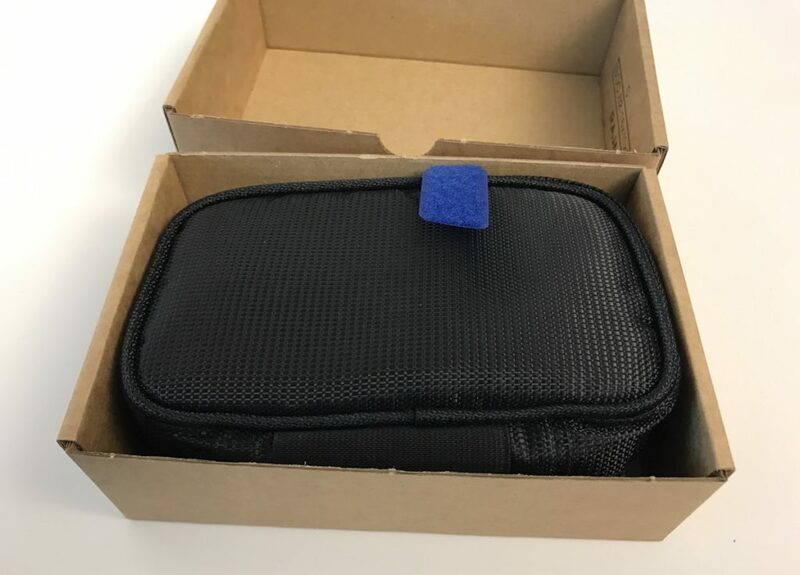 If you look at the image below, it’s clear that the lip of the Siemon boot goes just over a small ledge in the plastic, and that’s enough to stop the click. Pulling it back so that it just rises over that plastic ledge is enough to fix the problem. The vast majority of Pockethernet features are achieved in tandem with an iPhone/Android app which controls the tests and displays the results. I have only tested the iPhone app, operation of which is reasonably straightforward and for the most part it’s pretty intuitive. I did not need to read the manual, for example, to execute my first set of tests. I will include some videos and screenshots from some more detailed testing in my next post, but the key point is that courtesy of BLE4.0 (Bluetooth 4), connection was immediate and simple, and control worked well. A few times the connection seemed to drop unexpectedly, but reconnection was immediate when I clicked the Connect tab, and it didn’t really get in the way of my testing. I can’t tell if the disconnection was due to my phone or to the Pockethernet, so I will make the assumption that it was my phone, unless I find evidence to the contrary. 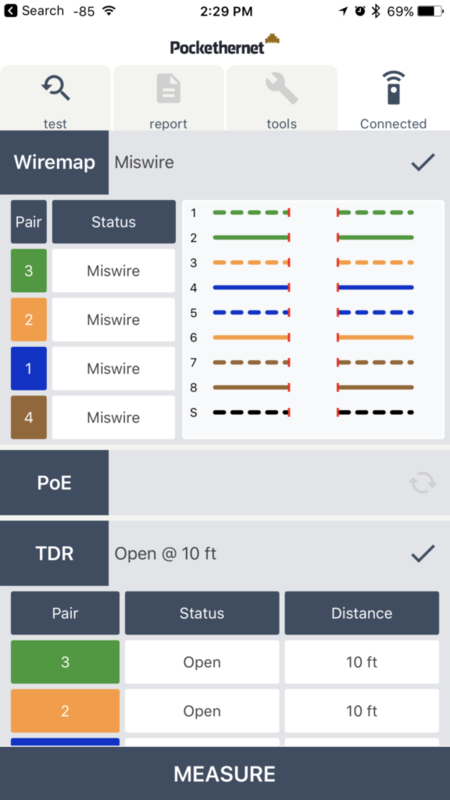 In addition to the app-driven testing, Pockethernet also has a quick standalone mode where, for example, it’s possible to quickly test a cable wiremap without needing to pull out a phone. Results are displayed using those four LEDs, and the color indicates the result (more on that in a moment). Finally, and this really is the kicker, the tester can be used as a flashlight; two taps on the power button and the cable test LEDs all illuminate at the same time, giving enough light to make a difference in a dark situation (though obviously this isn’t going to replace your MagLite any time soon). When I first looked at the list of Pockethernet’s features and mentally compared it to the price of name brand devices with similar capabilities (particularly the, uh, yellow variety), it was clear that this is a pretty amazing proposition. I’ll leave you to do your own research, but my evaluation was that Pockethernet is remarkably good value. It’s at a price point that puts a fairly comprehensive set of features within the reach of not only professional engineers but also domestic network engineers (i.e. the poor saps who get the complaints from the rest of the family when the internet is slow). The real question is, does Pockethernet do what it claims to do? Spoiler alert: yes, and in a future post, I’ll share some videos and screenshots of the Pockethernet app at work, and you can see for yourself! Pockethernet sent me a NFR (Not For Resale) device for the purposes of evaluation. 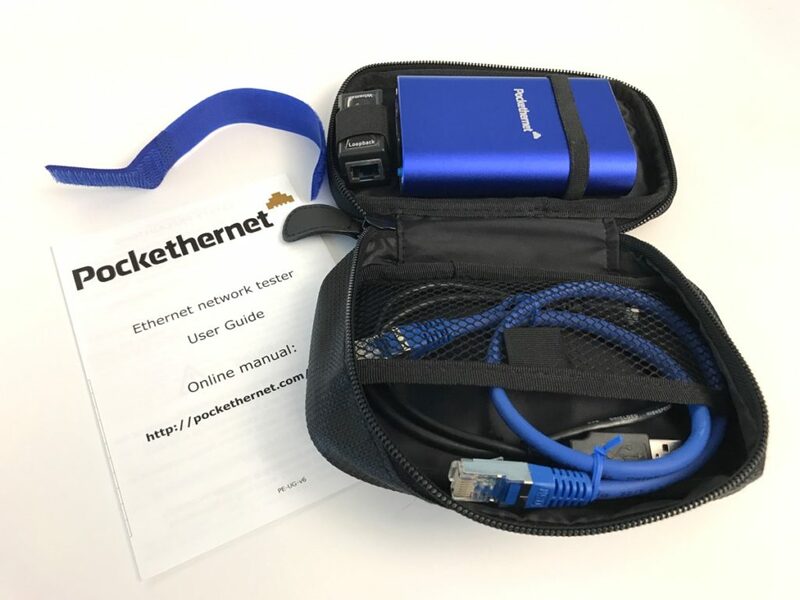 For clarity, I approached Pockethernet (not vice versa) and made a request for a review/NFR unit because the Pockethernet tool looked like something that my readers would enjoy and could make use of. I am not being paid for this review, and the content is entirely my own. It would be really great if there were something small like this that could run iperf3. I love the dhcp indication. That’s awesome! It wasn’t clear though. Can it only charge via USB or can it also charge via PoE?